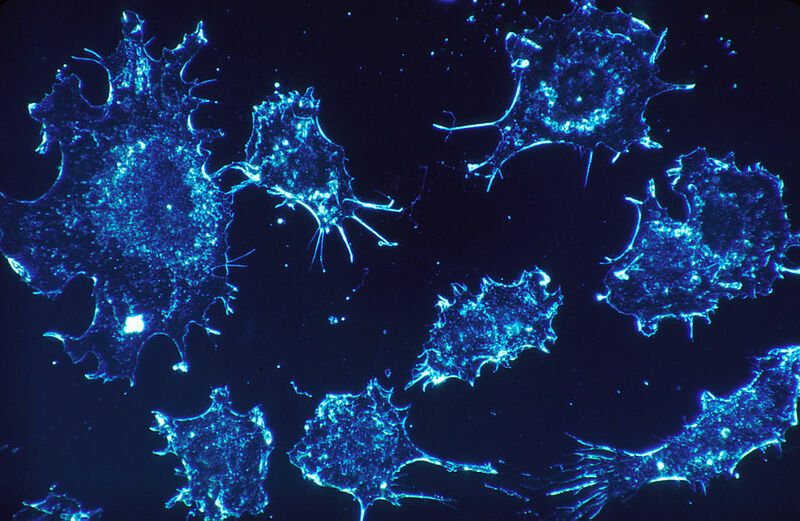 What is the difference between a tumor cell and a normal one? Among other things, cancerous tumor cells divide indefinitely without damage to the cell. How does this happen? : A little thing called a telomere. When DNA replicates, it is “read” by an enzyme called DNA Polymerase that tells the cell’s protein manufacturers what to make and their order. The enzyme moves along the chromosome like a train on a track, but stops when it gets close to the end. The proteins at the end aren’t recreated so the chromosome can shorten. When it does, replication can become imperfect, perhaps even loosing genes at the end of the chromosome where the DNA Polymerase has to stop. There is evidence this flaw in replication can cause cell damage, and eventually death. Immortal cancer cells on the other hand, have an enzyme called telomerase that restores shortening telomeres after each division. Many organisms procuce telomerase and cells grown in a lab and treated with telomerase also become immortal. Yet before we celebrate our newfound immortality, there are a few things to keep in mind. Most of the body’s cells are post-mitotic, meaning they stop dividing at an individual’s birth, but those cells can still experience aging. Some organisms that have long telomeres live a very short time. There are also organisms that generate telomerase but have short lifespans. Like all theories of aging, the shortening of telomeres does not explain all age changes, but treating some cells with telomerase could be a piece of the anti-aging puzzle and possibly, an important part of the immortality I’m creating in my novel, The Phoenix Gene.